California, here we come! From June 24-26, The Shade Store will be in Los Angeles at the Dwell on Design trade show. We have partnered with Consort Design, the LA-based design firm, to style the front portion of our booth. They will be designing the walls and window treatments of a “living room,” as well as designing the rest of the room with furniture and accessories from their store. Find out more about Consort’s founders Mat Sanders and Brandon Quattrone and what inspired their choices for Dwell on Design. 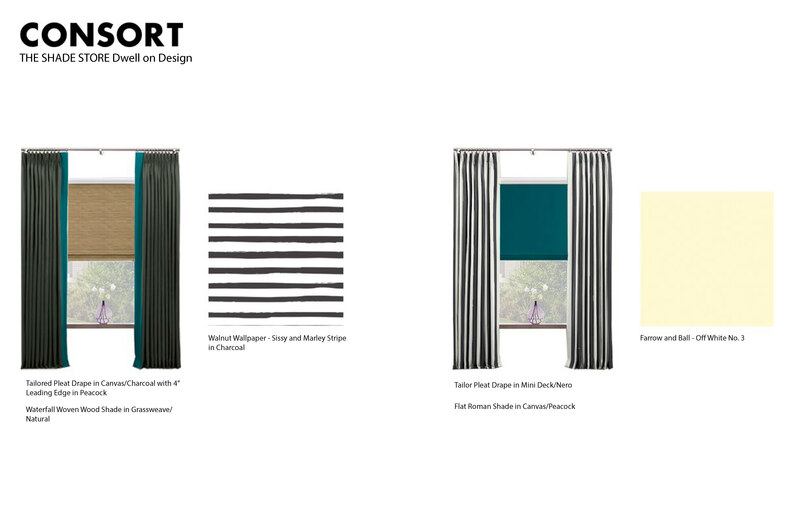 What was your inspiration behind your window design for The Shade Store’s Dwell on Design booth? We’re always inspired by the ease and style of the Hamptons, but especially at this time of year so we opted to go with an updated and modern take on a classic beachy look. Black, white, and gray is a classic combination we often come back to and lately we’ve been obsessing over blue-green colors like this vibrant peacock which we’re using here as an unexpected accent. We’d love to install this look in a hip Hamptons—or Malibu!—beach house. Woven shades and cabana stripes are always welcome in coastal homes but the pops of color and painterly wallpaper help give this combo a fresh perspective. We’re all about adding layers into our designs through art, accessories, and especially window treatments. The additional texture as well as light filtering flexibility add both form and function to our work. We love a stripe! Classic yet versatile. Working with The Shade Store is so convenient for us and our clients. The options and combinations are seemingly endless and you can’t beat the price point or lead times for custom window dressings. Our work is all about taking classic design and mixing in modern shapes and styles and this horizontal stripe does exactly that. What window treatment advice do you most often give to your clients when decorating a space? Go as high as you can when hanging drapes, a flat-fold Roman shade will never go out of style, and don’t be afraid of pattern and color. Window treatments have the power to completely transform a space! Can’t go wrong with linen, we use it all the time to add texture to a space but not overpower the room’s other elements. Patterned shades are a great way to add interest to an otherwise stark space like a bath or kitchen. We recently installed some patterned Shade Store Romans in an all-white and marble kitchen and it really makes the space pop. At the beginning! We recently checked in on a gut renovation we’re working on in Phoenix. The house was down to the studs and we were already brainstorming shade and drape styles! Consort is a cutting-edge classic interior design studio and shop founded by Mat Sanders and Brandon Quattrone. With expertise in architecture and decor, Consort specializes in a creating casual-cool spaces for the fashionable class. Their fresh and edgy designs have been celebrated among their star-studded list of young hollywood clientele, including Jessica Alba, Ben McKenzie, Nina Dobrev, and Sophia Bush. The firm currently services projects in Los Angeles, New York, Telluride, and Phoenix. Consort opened its first brick-and-mortar store, along with an online shop, in December 2015. Mixing playfully chic décor, custom furniture, art and vintage, the Melrose store has quickly become LA’s hottest new destination for the casual-cool home. Register for Dwell on Design LA here, and come see us and Consort’s designs at Booth #2017.